Cindy Chamberlain, L.Ac., Dipl.Ac, Dipl.CH, is an Overland Park acupuncturist and practitioner of Traditional Chinese Medicine (TCM) licensed in Kansas and Missouri. This ancient art of healing, originating in China, has proven very effective for a wide variety of medical conditions throughout the world. TCM has a practical, common sense approach to healthcare. By addressing lifestyle issues such as diet, exercise, rest and meditation, as well as Chinese medical techniques, Cindy treats patients in a holistic manner which results in positive, long-term results. Traditional Chinese medical techniques include Acupuncture, Chinese Herbal Medicines, Qi Gong (an internal art form which promotes breath control and relaxation) and Chinese massage therapy modalities. The goal of Chinese medical treatment is to enhance the body’s ability to heal by improving blood flow (circulation) to areas of the body where circulation has been impaired due to past trauma. This lack of blood flow can eventually cause a variety of symptoms such as pain, weakness, difficulty sleeping, digestive problems, immune system deficiencies, respiratory issues, vertigo, depression and anxiety and many others. Acupuncture addresses these circulatory defects through the central nervous system (brain). By stimulating specific nerve junctions (acupuncture points) which stimulate a specific part of the brain, acupuncture causes the brain to re-open circulatory pathways which then promotes healing. Chinese herbal medicines address illness by restoring balance to the body. As unique individuals, we each have a specific body type and various genetic propensities. For example, a person may tend have cold and damp tendencies which cause them to retain fluids, feel cold, gain weight and have excess mucous. Balance could be restored by giving this person herbs that are warm (or hot) and dry in nature. 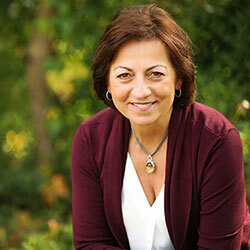 Cindy has practiced Chinese Medicine since 1996. In addition to many educational accomplishments, she completed a 4000-hour Chinese medicine apprenticeship program under the tutelage of Dr. Joseph Thomas, PhD, DiplAC. She has been personally and continually trained by two world renowned Chinese Medicine experts: Dr. Richard Teh Fu Tan and Dr. Jimmy Zhang Wei-Yin Chang. Since 1998, she studies and utilizes the most effective acupuncture principles: the Balance System personally taught to her by Dr. Richard Tan of San Diego, CA. Since 2002 Cindy has the honor of being personally trained by Dr. Zhang Wei-Yin (Jimmy) Chang of Los Angeles, CA. From Dr. Chang she has learned the ancient art of Chinese pulse diagnosis and advanced Chinese Herbology. 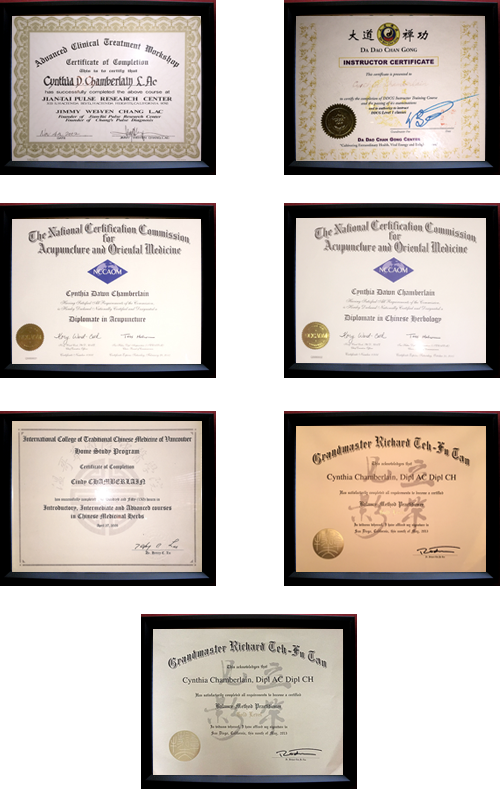 Cindy holds national certifications both in Acupuncture and Chinese Herbology by the National Certification Commission for Acupuncture and Oriental Medicine (NCCAOM). She is also certified in Shiatsu bodywork. Cindy has been a practitioner of various styles of Chinese martial arts for over 25 years.